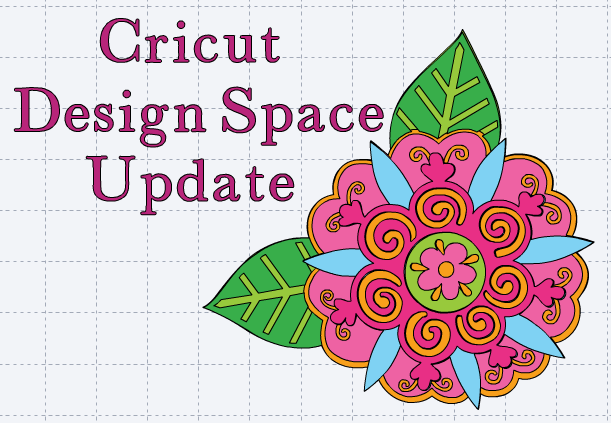 An update to the Cricut Design Space (the online software that controls the Cricut Explore) was released on Tuesday. Quite a few improvements were made and many of them were directly based on user feedback. While the software still is missing some widely desired features (such as alignment tools and shadow/offset), the new version has improved many features of the program. There were a few issues with updating (some cartridges were suddenly not showing up in the library) but these seem to have been corrected quite quickly. I took some screen shots as I did the update and they might be helpful if you haven't been able to update yet. 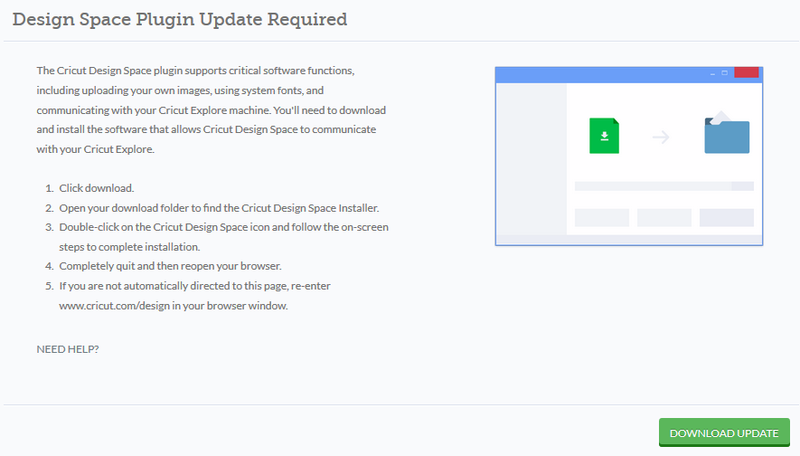 When you open the Design Space and try to insert an image, you will see this message alerting you to the need to update. Be sure to read and follow the directions. 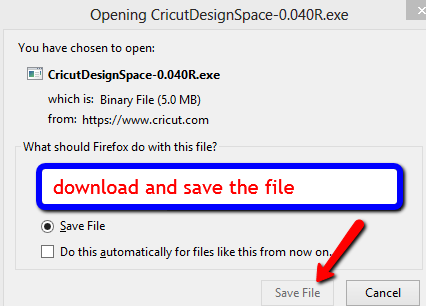 Click the green "Download Update" button and then save the file to your computer. 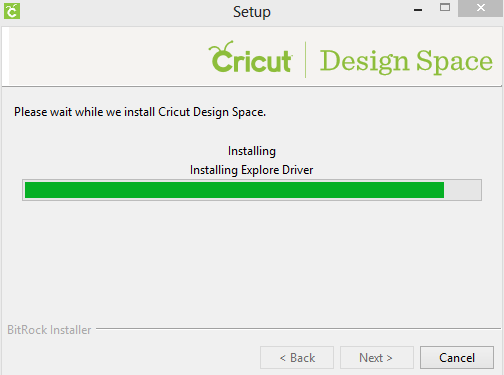 After the file has downloaded, double click on the Cricut Design Space icon (wherever you saved it upon downloading, usually it is automatically placed in the download folder) to start the installation process. Be sure to close your browser when you start this process (you will get a warning notice if you forget). 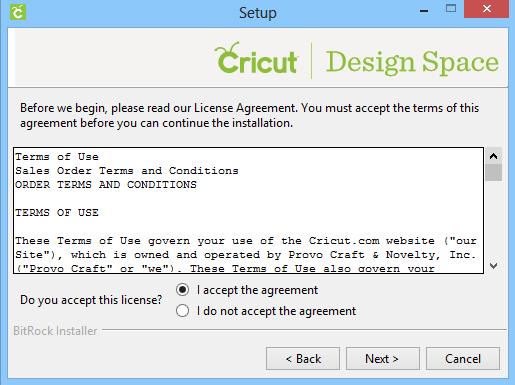 You will need to agree to the License Agreement to continue with the installation. 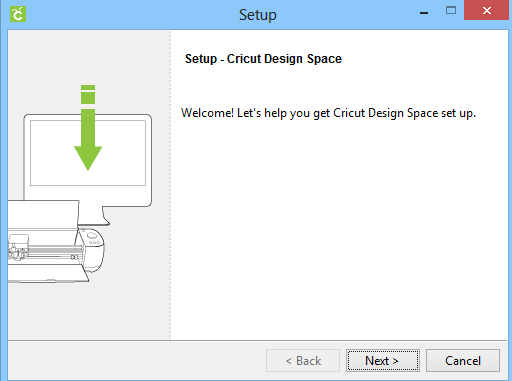 Now you can start the set up process. 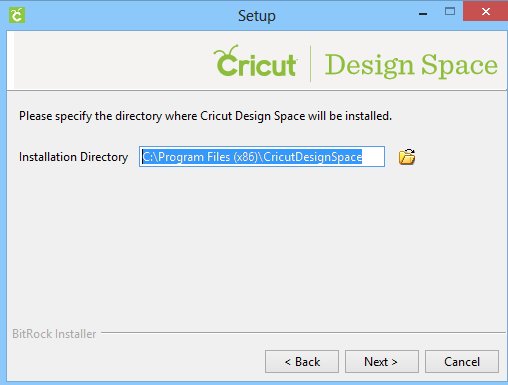 Just follow the on screen prompts to install the new plugin for the Design Space. 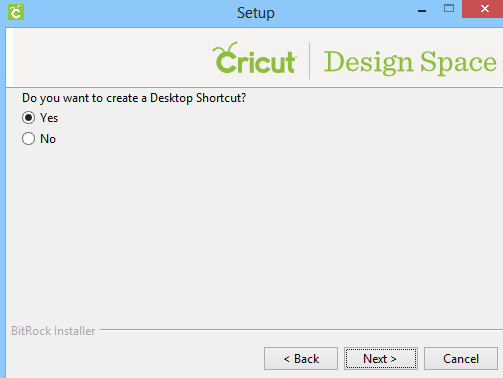 Click yes to create a desktop shortcut (if you want one). 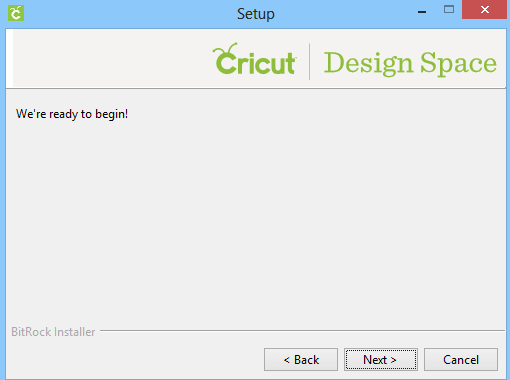 Click "Next" and wait while the setup takes place. Click Finish and you are ready to start using the updated version. 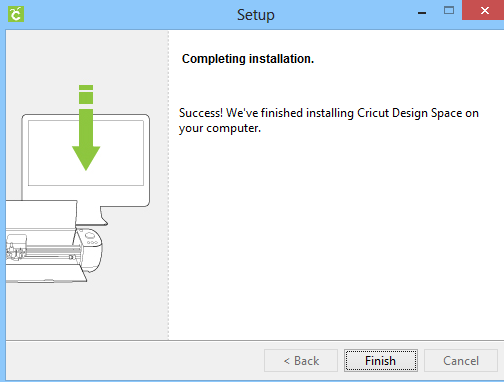 I am using Windows 8 so your screens may be different on another operating system. Instead of seeing four random and not always readily identifiable images for each image set, some of the cartridges and sets now have two images and the name of the cartridge (in tiny black type - it would be nice it it could be made a little larger). There is also a blue background at the bottom to make it easy to read the status of the cartridges (purchased and linked, subscribed or free). 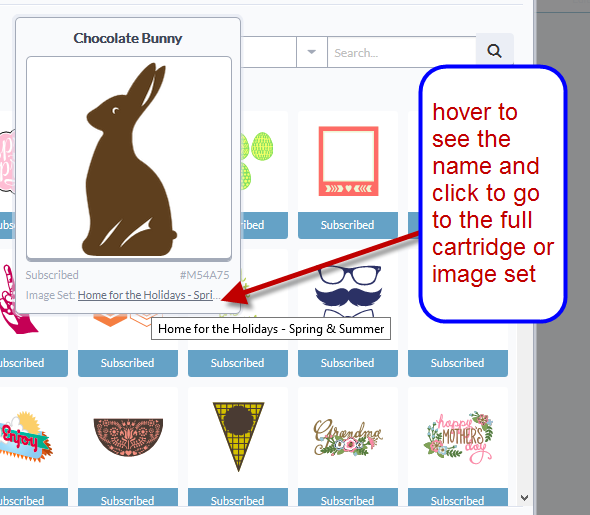 When you hover over an image, you can see the name of the cartridge or image set at the bottom of the preview box. You can click on this name and go to the page showing all of the images in that set. If you want to be able to share notes about your projects, you may want to write down the source of each image. At this time, once the image is in your project, there is no easy way to determine which cartridge or set it came from. 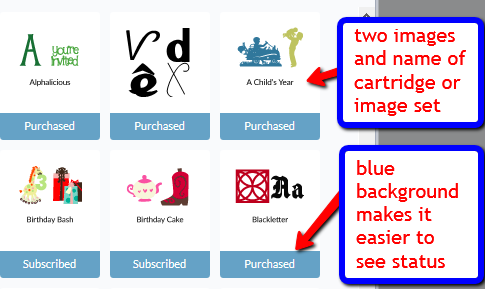 You can do this by creating a text box in the work area and listing all of your "ingredients" for the project. Then, just hide the text by clicking the eyeball in the layers panel to hide the information when it is time to cut the project. The grid lines have been made darker in the updated version. This makes it easier to plan your designs. 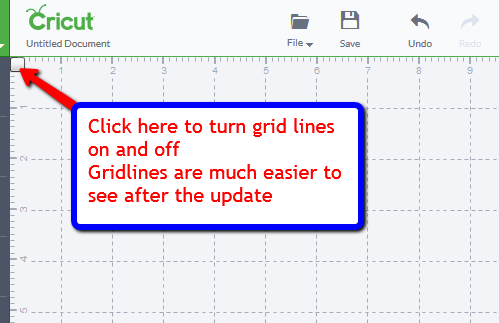 To turn the grid lines on and off, just click on the small box at the top left of the work area. You can now delete images that you have uploaded and don't want to keep in your library. You can link cartridges that you own to your account at any time, even if they are included in a subscription plan that hasn't expired yet. A Material Saver mode now allows images to be cut in the most efficient manner, conserving your cardstock, vinyl or other material. You no longer need to ungroup text in order to attach it to an image. 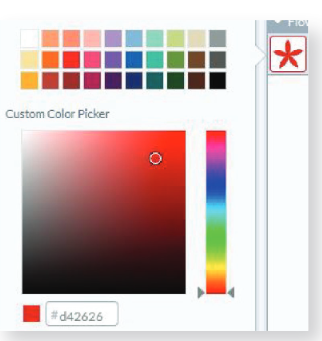 A color picker has also been added allowing a full range of colors to be chosen as you design. I wish there was an eyedropper to sample colors and apply them to images. 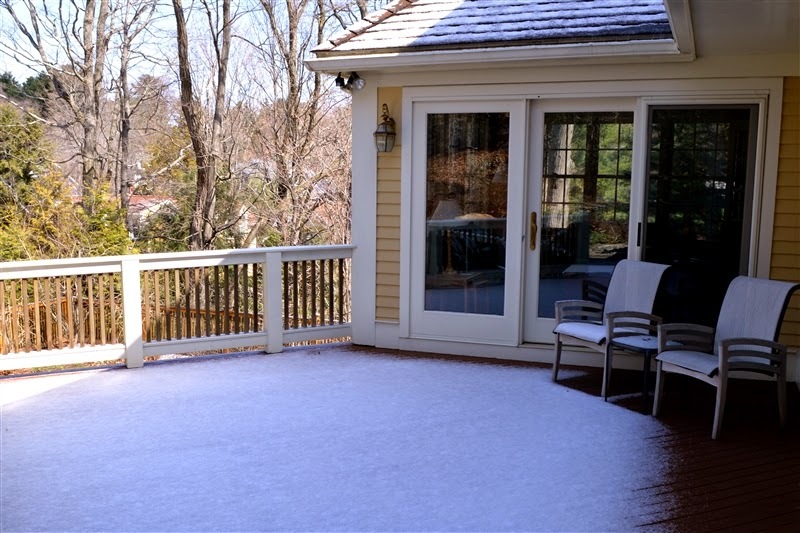 It snowed here today - it seems like winter still isn't quite finished with us this year! Thanks for the tutorial. I can always count on you to show me the best way to do things. Thank you so much for the info...Have a wonderful day!